In the fairy kingdom lived a young girl called Claire who was known as the ugly fairy. She was 17 years old and had been hiding at home all her life because she was ashamed of how she looked. The ugly fairy only left her house once a month to go to the fairy ceremony, where old fairies shared their knowledge and experience with the rest of the fairies. Claire always wore a mask, when she went out to rescue a child on a mission otherwise the child would always ended up saying: “Go away, you ugly fairy!”, and the poor fairy always felt very sad when this happened. One day at the monthly event, the lights went off and a group of witches flew in to kidnap all the fairies and steal their powers, but they didn’t catch Claire because she had forgotten to put on her mask, and so they thought that she was a witch because her face was full of warts. 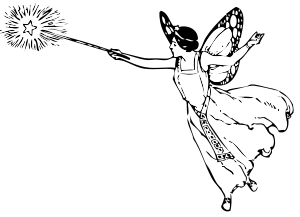 Later, when the witches were celebrating their victory, Claire turned invisible and flew to the prison to save all the other fairies. From that moment on, all the fairies have realised that Claire is in fact, a brilliant fairy, and that they shouldn’t treat her badly, and that is how Claire recovered her self esteem and learnt that beauty is not the most important thing.